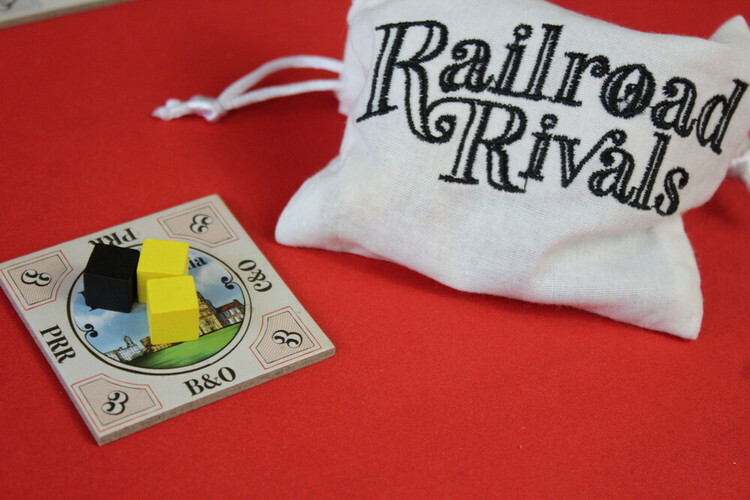 In Railroad Rivals you will be building your stock portfolio of the twelve railroads that stretched across America during the 19th Century whilst connecting cities and making deliveries to increase the value of that stock. Tile drafting and laying combined with stock acquisition may seem like an interesting combination but Railroad Rivals meshes the two effortlessly. Glenn Drover has a pretty good pedigree when it comes to train games (Railways of the World) so the stakes are high! Give each player the locomotives and character card of their chosen colour. Place the wooden cubes needed for the player count into the goods bag (2-3 players just the brown and yellow, 4 player brown, yellow and black and if playing with 5 players use all the cubes) Take the Chicago, St Louis and Cincinnati city tiles, shuffle them up and randomly pick one. This will be the starting city tile for the game. Place it in the centre of the table and draw randomly and place the appropriate number of cubes on the tile. Shuffle the two city tiles you didn’t pick in with the other city tiles to create a draw deck. Deal two city tiles face down to each player. This is their starting hand. Shuffle the stock tiles to create a draw deck and place it next to the city tiles. Take the character cards from each player, shuffle them and deal them out left to right, this will be the player order for the first round of the game. Place a locomotive from the starting player on six points on the score track, the second player on eight and each subsequent player two points ahead of the last. Place the stock price markers next to the board. You are now ready to play! 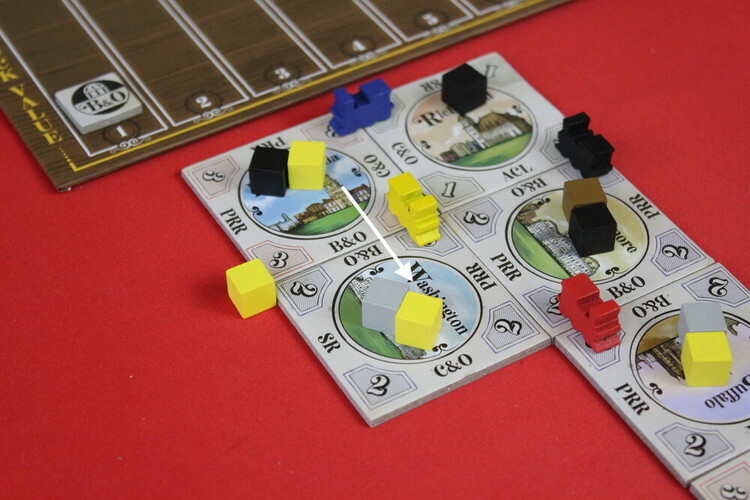 Draw a number of city tiles and stock tiles equal to the number of players, so in a four player game you will have a total of eight tiles in the display. These are the tiles players will select this round. Next, bid for turn order. In the first round this is decided randomly so won’t happen, but in subsequent rounds it will. Starting with the player last in the current turn order players will bid on the chance to go first in the round. Each player must bid or pass, all bids must be higher than the previous bid. Once you pass you may not come back into the bidding. Bidding continues until all but one player has passed. 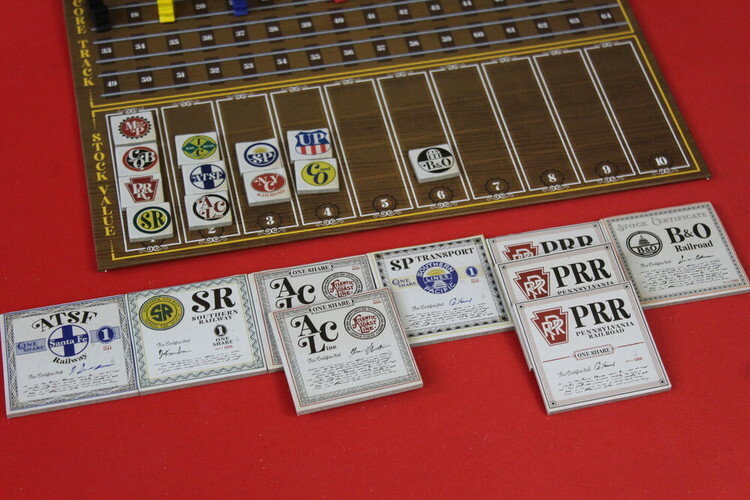 That player pays their bid in points by moving down the score track and their character card is moved to the front of the row. This will be the new turn order. In turn order, beginning with the start player, each player will place a city tile. At least one railroad on the edge must match the railroad on the edge of the city tile you place it next to. When you create a match, you create a link which you now own. To show that, place one of your locomotives across the tiles that match. After placing your city tile and locomotive, blindly draw a number of cubes as shown on the tile and place them there. If you manage to make multiple matches with a city tile, place a locomotive across all edges that match. Wherever possible, you must make a match each tile placement. If you cannot match railroads you must match blank spaces, in this case you do not place a locomotive. If you cannot make a match at all you must pass and not place a city tile this turn. After placing tiles, players will get a chance to deliver goods. Beginning with the start player and continuing in player order, everyone will get a chance to deliver one goods cube. You may pick a goods cube on any city tile and deliver it across any link to another city tile. If the link is owned by another player that is not you, that player gains two points. The value of the railroad company used to deliver the goods is increased by one. Move that company's stock value marker up one on the stock value board. The player who made the delivery also gets points. Three points if that colour cube has not been delivered yet this turn, two points if it has been delivered once already and one point if it has been delivered twice or more that turn. When you have delivered your goods keep the cube in front of you so players know what has already been delivered this turn. Once all players have made deliveries, place all the cubes back in the bag. Draw tiles and start a new round! You will get to a point where there aren’t enough city tiles to fill the draft. When this happens, remove any extra city tiles and place two stock tiles per player rather than one city and one stock. 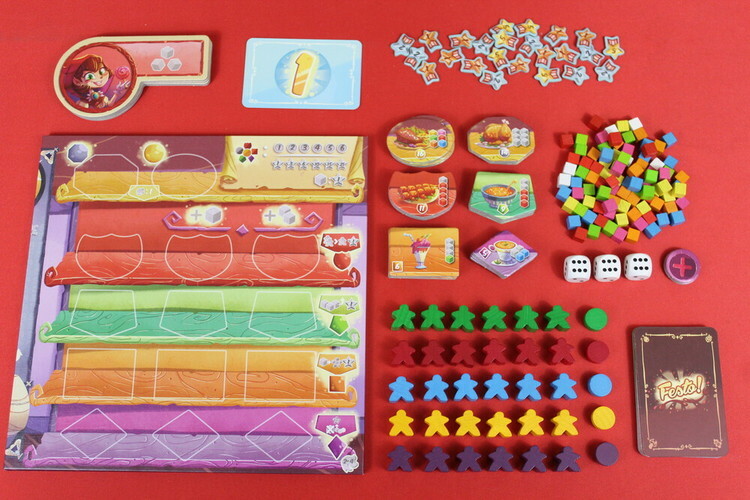 Now, players will draft two stock tiles at the beginning of the round. Place city tiles as before and the last turn is triggered when players place their last city tiles. Continue until the end of the round then start scoring. 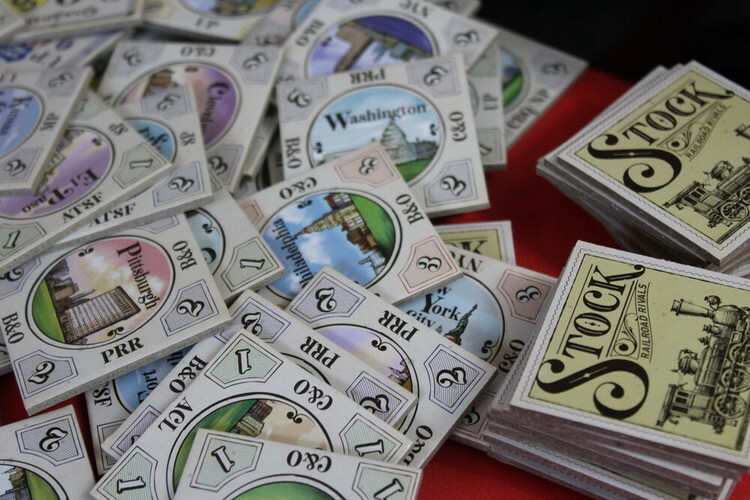 Each player scores points for each stock tile they own based on the value of the Railroad as shown on the stock value track. For example if you have two Union Pacific stocks and their value is at four they would grant you eight points. Add the score for all your stocks to your current score. The player with the most points wins! In the case of a tie, the player with the highest valued stock wins. We initially learnt and played this at two players and whilst the main game play was good, the bidding for first place didn’t really work. You may get one extra point for delivering goods, but unless there was a stock tile you really wanted it just didn’t seem worthwhile spending points to gain an extra point. 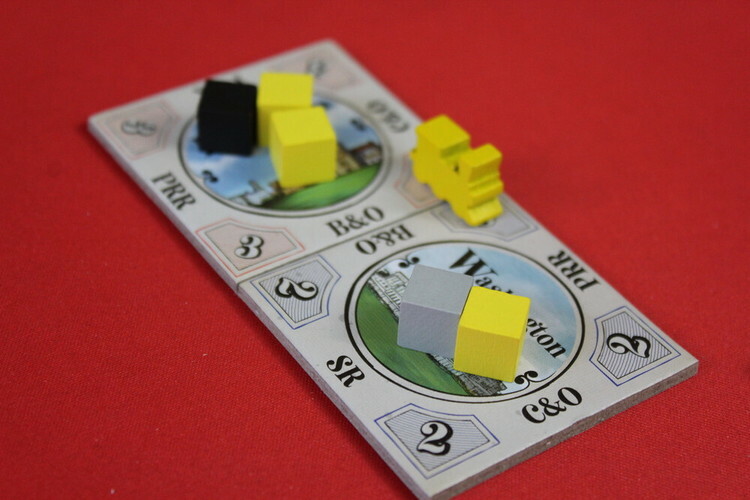 However, at four or five players, that bidding can get fierce and with the extra stock and city tiles to choose from, there will quite often be something you want to pay those extra points for. This is also where you end up giving away points on deliveries to bump up the price of your stocks. Everything about this game is beautiful, down to the historically accurate Railroad companies with the original logos and trademarks, buildings artwork and the great chunky tiles. The tile stock itself feels ruggedly industrial for thick card. This is a great introduction to the world of train games, introducing a lot of principles and concepts that are used in much heavier games. With an experienced gaming group it plays fairly quickly and makes a great ‘school night’ game. Forbidden Games are becoming a force to be reckoned with, I am really looking forward to their next game Extraordinary Adventures: Pirates! which is still open for late pledging on Kickstarter. 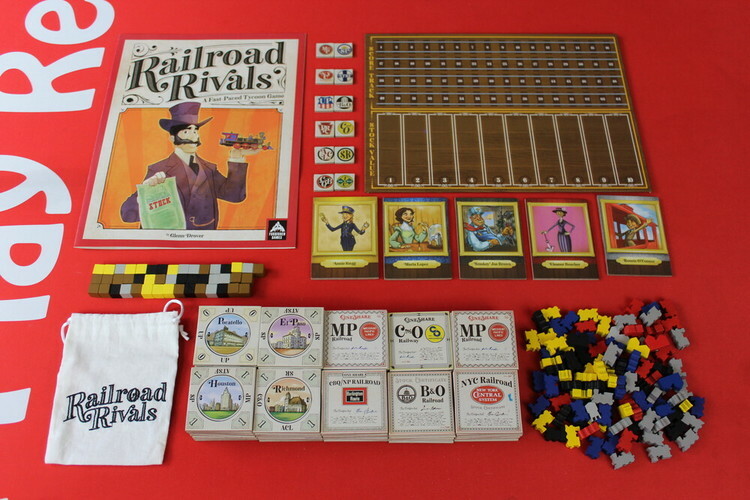 Not to mention they already have an expansion for Railroad Rivals coming to Kickstarter next month. 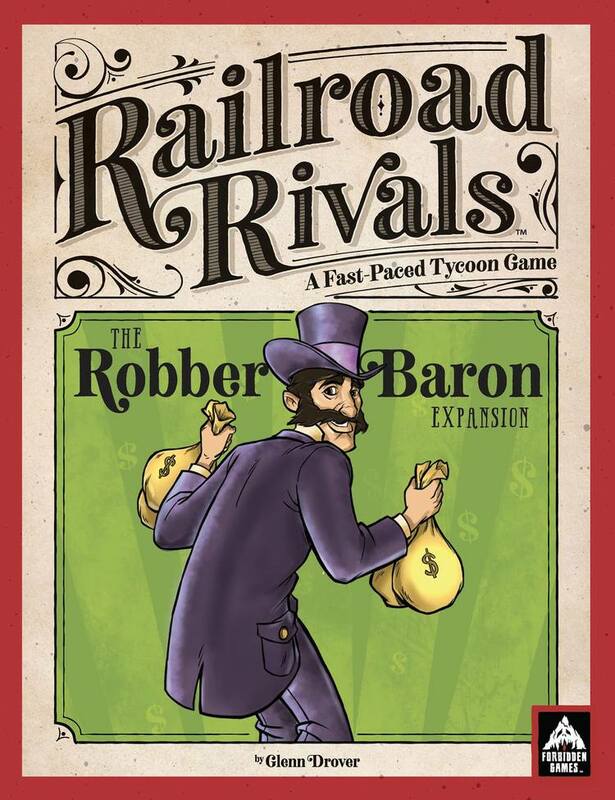 Coming Tuesday February 26th to Kickstarter the Robber Baron expansion for Railroad Rivals. This expansion will include lots of great stuff, including a 6th Player color (Green), a new commodity (white cubes for mail/passengers), a new railroad stock (NYNH&H), new city tiles along the NYNH&H, upgrade tiles, and stock shenanigan tiles which allow the players to manipulate stocks. 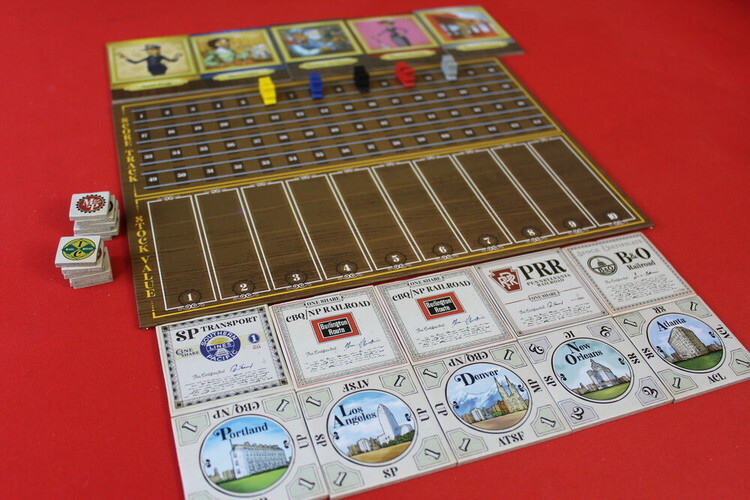 This first revealed tile is the locomotive upgrade tile which has to be drafted instead of a stock, but will give the owning player an extra point for every delivery.